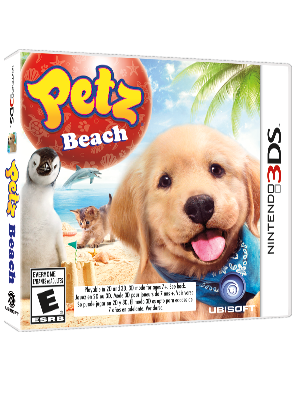 Petz Beach transports you to a fascinating land of white sand beaches, where you can get to know exotic and familiar animals. Whether you're tossing a ball for the dog, offering the neighbor's cat some treats or teaching a friend's parrot a new phrase, you enjoy spending time with and caring for animals of all kinds. The only thing that could be more fun than having a whole menagerie of animals to love and play with is making friends with those lovable animals in an exciting paradise to explore with them. Grab your Nintendo 3DS and get ready to adopt and care for a host of adorable new friends. Make new animal friends as you adopt and care for 28 breeds of dogs, 6 breeds of cats and a variety of exotic ocean-themed Petz, including dolphins, penguins and polar bears. Explore your tropical surroundings to unlock shops, a petting park and other new buildings, and stay entertained with quests and events. Befriend a community of villagers as you aid in neighbors' quests, attend a Halloween party and help seek out a lost ring. Locate more than 200 in-game collectibles, and outfit your Petz in unique costumes. Help your animal friends learn new tricks and skills with voice recognition, and show them you care by bonding via facial recognition. Enjoy learning about the natural world with facts about animals, plants and insects from Encyclopedia Britannica. Share the fun with friends as you exchange items and photos across games (additional games not included). Your Petz are waiting — are you prepared to give them the love and attention they need? Help your animal friends learn new tricks and skills with voice recognition, and show them you care by bonding via facial recognition. Enjoy learning about the natural world with facts about animals, plants and insects from Encyclopedia Britannica. Share the fun with friends as you exchange items and photos across games (additional games not included). Your Petz are waiting — are you prepared to give them the love and attention they need? Journey to a stunning landscape of white sand and swaying palm trees as you care for a variety of animals on a beautiful ocean vista. Get to know dolphins, polar bears, penguins and other exotic ocean-themed Petz, plus 28 breeds of dogs and 6 breeds of cats. Enter an exciting world of quests and events, and explore the land as you unlock new buildings, including shops and a petting park.